I personally wanted to extend to each of you my Christmas greetings! During the past few days of Filipino Novena Masses here in the US, I was reminded that Our Lord’s ancestors were not exactly saintly material or people filled with grace. Numerous people in the genealogy alone are grave sinners or doubtful of God’s plan for salvation. Yet we hear that regardless of their sinfulness, God gave them chances to change, to become better people, to continue to be recipients of His grace and goodness. Also, we are reminded that nothing is impossible in God’s plan as long as we place our trust and faith in Him. We hear that message in several readings – the barren shall bear children (story of Samson and John the Baptist), the “Yes” of Mary to Gabriel’s message of good news, the debate that Joseph had on taking Mary, to name a few. I also would like to recommend to you to read and ponder on the Magnificat and on the Praise of Zacharias, the father of John the Baptist. Both are prayers (recited during Morning and Evening Prayers) of praise and thanksgiving to God for what He has done for us and how He treats us. We are all 'blessed' and it is through His grace and love that we are blessed like the Virgin Mary. Let us bask in this glorious grace and blessing from God at all times. As we celebrate the mysteries of Our Lord’s coming, let us not forget to place our trust in God, the source of all goodness and grace! It is through our obedience and desire to follow His precepts that we are ‘full of grace’ as in the words of the Angel Gabriel to Mary. Let us not let our sinfulness distance ourselves to Him but instead bring us closer to Him through that sanctifying grace! May Jesus bring you peace, joy and abundant grace always! Peace be with you my friends in Christ Jesus! Go, enjoy the month with family and friends and loved ones! 1) Giving Tree is coming up soon at the Cathedral. Come help a fellow Christian in need and make them smile this Christmas season! 2) I believe St. Vincent de Paul Society at the Cathedral is going to feed at Bryden House on Saturday, December 8, 2012. I will go find out if this is still happening. 3) Saturday, December 8 is a Holy Day of Obligation, as it is the Feast of the Immaculate Conception. At the Cathedral there will be the anticipated mass at 5:15 PM on Friday, December 7 and ONLY the 10:30 AM Mass on Saturday, December 8. The mass at 5:15 on Saturday, December 8 is for the 2nd Sunday of Advent. 4) You can join us on First Friday Mass on December 7 at Holy Cross Church at 7:30 PM and for Eucharistic Adoration that will follow after that. It is a good way to meet with Jesus before he enters our hearts this Christmas. 6) Spreading holiday cheer and goodwill towards your neighbor, friend, enemy, long lost friend, someone you had an argument in the past, etc. 7) There are other Young Adult Groups in town that have something prepared for December, you can participate in those events as well! 8) If I come up with anything, like a Hockey Game or some fun filled event, I will let you know via e-mail. In the Philippines, the 9 day novena masses are held at dawn (Misa de Gallo, Mass of the Rooster's crow) like 4 AM or 5 AM in some communities. 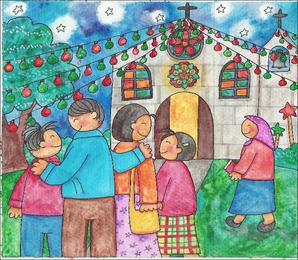 The anticipated Novena masses are held at 8 PM (Simbang Gabi) of the night before December 16 through December 24. The mass is a 9 day preparation of heart and soul for the coming of Our Lord into our lives and actually a Novena reflecting on the events of the life the Blessed Virgin Mary leading to the nativity. Normally, Filipino communities have lanterns that are lit throughout the neighborhood directing people to church at 3AM so that the people would know where the mass celebration will be held at. You may heard also of the O Antiphons recited at mass, there are 8 of them (starts on December 17-24 daily mass) and is usually sung during Advent to the tune of 'O Come, o come, Emmanuel'! Here in the Diocese of Columbus, we are having our own Filipino-style Simbang Gabi (literally translated Evening Mass). 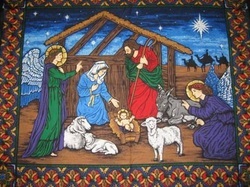 The mass is at 7:30 PM every day from December 15 to 23. On the 23rd there will be a great feast after mass. It is being held at Holy Cross Parish (where we do our First Friday Devotions). The Novena Masses will be in English, so everybody is welcomed to participate! You are more than welcome to come and be infused with great love and anticipation to the great celebration of the Birth of Our Lord Jesus Christ. We are all cordially invited to experience like no other, Handel's Messiah presented by the St. Joseph Cathedral Choir on Friday, December 14 at 7:30 PM at Westerville, St. Paul the Apostle Church and on Sunday, December 16 at 7:30 PM at Columbus, St. Joseph Cathedral. The performance of the choir will be graced by the Cathedral Chamber Orchestra. The ticket prices are at $20 ahead of time or at the door before you enter the church nave area. Come and let us enjoy this beautiful musical event! The proceeds from this ticketed event will benefit the Saint Paul Church organ fund and the Cathedral Music Endowment. This website page will be updated of any upcoming activity that the Young Adult is preparing for or scheduling. When the activity is red it is still being scheduled and we are working on it. When it is yellow, then it is definitely going to happen. You, the member, are the reason why these activities are being put together!